No matter how you feel about your cat’s claws, odds are your cat is going to want to stretch and scratch – even if he doesn’t have any nails. Scratching is a normal, instinctual behavior for your cat. They do it to stretch and exercise, to mark their territory and to get rid of old claw layers. The trouble is often our cats tend to stretch and scratch on inappropriate surfaces. Fortunately, you can train your cat to understand which are acceptable scratching posts, and which pieces of furniture, like your new leather chair, are not. Here’s what you can do. As with most training, start early. Instilling habits and correcting behaviors early on can save you a lot of worry. One thing that I’ve recently learned is that the scratching behavior begins as early as when your kitten is being weaned. That said, if you can train your cat when he’s still a kitten, excellent. If your cat is older, you can likely still train him with constant practice and patient, but it may take longer to end old habits. The point of the training is to teach your cat where he can scratch and where he cannot scratch. Cats are territorial, so you’ll want to make it clear which is their “furniture” and which is yours. Posts that are covered in sisal, carpet or rope will often do the trick. 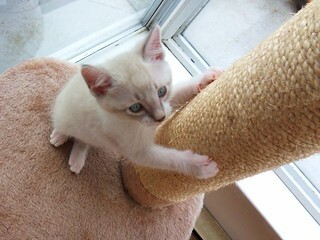 They should be taller than your cat is when stretching, and it should be on a sturdy base. 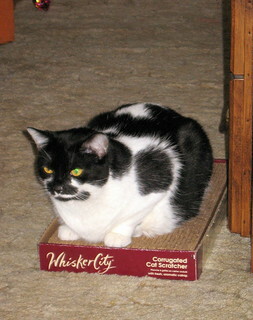 While reasonably priced scratching posts can be found, you may also want to look into low-cost corrugated cardboard scratch boxes. Once you’ve found a post that can work for your cat, place it in an area that your cat likes to stretch. This can be near their favorite napping place, next to your leather chair that they’re tempted to scratch, etc. Keep in mind that you want to keep it out and accessible. If you hide it away in some corner your cat never frequents, it shouldn’t be a surprise that your cat will never frequent the post. To help entice your cat to use the post, you can either sprinkle a little bit of catnip on it, or when your cat is feeling feisty dangling a toy against it for him to grab. Once he gets his claws into it, it should give him the idea! One word to the wise (something I’ve been guilty of), don’t place your cat’s paws on the scratching post and try to force him to scratch on it. He’s not going to get it, and he’s not going to like it. If he starts to scratch in an undesirable area (i.e. your leather chair), it’s up to you to correct his behavior. You can do this by speaking a code word in a loud, commanding tone. For example, you can try NO!, OFF! or CLAWS! This will likely startle your cat, which let’s him know it’s not OK.
You can then place your cat near his scratching post, to show him that some things are OK to scratch on, and some things are not. If your cat refuses to continue scratching after going after your chair, try enticing him again to use the scratching post by using cat nip or a toy. No matter how your cat decides to use his scratching post, always be sure to praise him when he does. They’ll so associate positive things with using the scratching post, and negative experiences when scratching on your chair. Of course this isn’t 100% fool-proof, as cats will be cats, but it’s a good start. Here’s another tip: If your cat continues to scratch your furniture, clip his claws. It doesn’t need to be too much, just enough so that if your cat decides to rebel and scratch your furniture, his nails won’t do as much damage. You can also cover vulnerable pieces of furniture with thick plastic sheeting, which will discourage scratching. Some even add strips of double-stick masking tape to the sheeting to ensure that the scratching stops. ← Should I Introduce My Foster Kittens to My Resident Cat? There is a product from America from a company trying to discourage declawing, which is a claw sheath that fits over cats’ claws like false nails. Each set lasts a month and is, I believe, $20. They fall off naturally as the claws grow. Anyone who knows me knows how I feel about declawing so I welcome this initiative. Our cats are very happy with a piece of sycamore [European Maple] trunk to scratch on, they like to scratch the bark off. Double-sided tape works great-esp on things like table legs where the tape can go all the way around. I have had quite a bit of experience with the plastic claw sheath (commonly called SoftPaws or SoftClaws) at the clinic where I work. If the alternative is de-clawing, I would definitely reccommend them. But I would reccommend trying other options first. Some cats don’t like them and will continually chew at them, or quickly pull them off. Also, cats wearing the SoftPaws cannot fully retract their claws; to me, that would seem uncomfortable.